Are you turning your dream of opening your own bar or restaurant into a reality and need a liquor license? Do you have a liquor license that you would like sell and need to find a buyer? 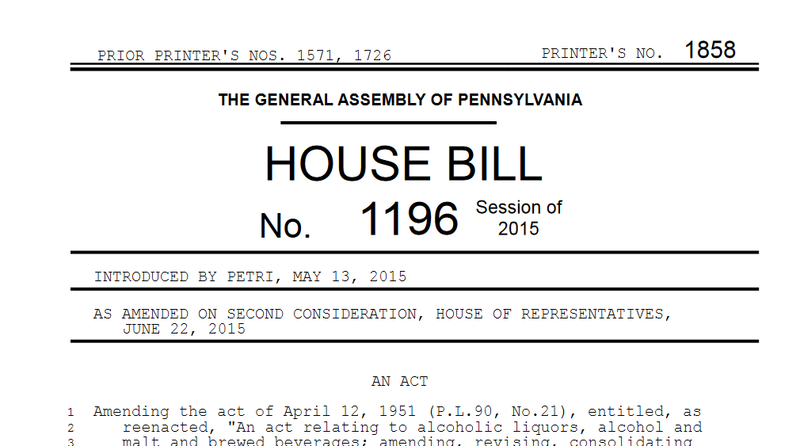 Let PA Liquor License Company, a division of Sofranko Advisory Group, do the work for you. With access to hundreds of licenses throughout Pennsylvania and years of experience, PA Liquor License Company helps expedite the buying / selling process. Our team of experienced professionals work closely with our clients to ensure a successful and seamless transfer. 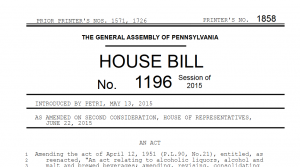 Obtaining a liquor license in Pennsylvania can be a frustrating and overwhelming process, but with PA Liquor License Company we have the staff and experience required to make the transaction smooth and effortless. Please call Laura at (412) 692-1031 today or email us at info@sofrankoadvisors.com. 1. Removes Limits on Sales of Malt or Brewed Beverages by D Licensees: Distributors can now sell malt or brewed beverages in any quantity to a person not licensed by the PLCB for off premises consumption. The sales are not required to be in the package configuration designated by the manufacturer and may be sold in refillable growlers. 2. Adds a Definition for “Growler”: A growler shall mean a refillable container for malt or brewed beverages that can be resealed. 3. Mead: Changes definition of malt or brewed beverages to include mead and adds a definition of mead. Limited wineries can make mead and distributors may sell mead made by a limited winery. 4. Limits on Geographical Area where D’s can Sell: A D can no longer sell or deliver malt or brewed beverages to a licensee whose licensed premises are located within the designated geographical area granted to an ID other than the ID that sold the malt or brewed beverages to the D. Also restricts an R licensee’s ability to move products to other locations owned or operated by the R if such locations are outside the designated geographical area granted to an ID other than the ID that sold the malt or brewed beverages to the D.
5. Creation of a Monthly Malt or Brewed Beverage Shipper License for Out-of-State Retailers: A person licensed by another state or country as a wholesaler or retailer of malt or brewed beverages can now apply to the PLCB for a malt or brewed beverage shipper license which will allow it to ship up to 192 ounces per month of malt or brewed beverages on the order of a PA resident who is at least 21 years old for such person’s personal use and not for resale. No more than 96 ounces of a specific registered or unregistered brand of malt or brewed beverages may be shipped to any one resident in a calendar year. 7. Sales of Malt or Brewed Beverages at Wholesale: Requires any person selling malt or brewed beverages at wholesale, and any person selling at retail if such products were not sold at wholesale, to file a report with the PLCB regarding the volume of such packaged and draft malt or brewed beverages sold. Clarifies that a separate exterior entrance is not required for a licensed premises with an interior connection. Allows retail licensees to begin selling at 9am on Sundays (previously was 11am or 9am if offered with a meal). Cleans up some miscellaneous issues regarding wine expanded permits. Increases the products a brewery, limited distillery and limited winery may cross-sell (now all PA products for on premises consumption), but adds a restriction on the amounts sold (no more than 50% of the on premises sales of the licensee’s own products for the preceding calendar year).